From creepy Halloween, to warm, fall-loving Thanksgiving and Happy Holidays to all, Walltat offers a wide range of fun holiday decor. It can be easy to put up and even easier to take down when the season is over. Check out just some of our available holiday decals below! We offer a wonderful array of options for the spookiest holiday of the season, some can be quite kid friendly, while others can be creepy and downright terrifying. Check out some of our Halloween related decor here. 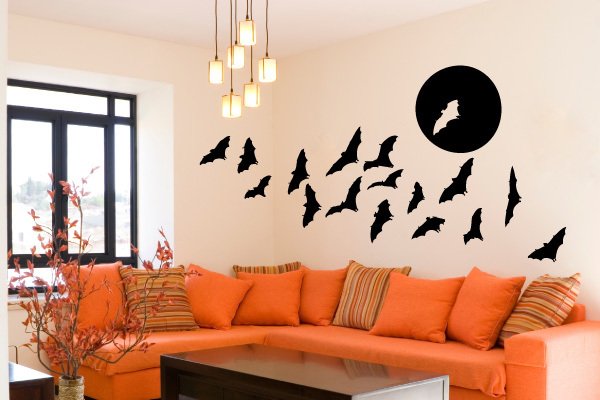 Use our wonderful Full Moon Bat Decals to decorate your walls or windows this spooky Halloween season. Unless you’re into zombies and gore, one of the first Halloween decorations that comes to mind is the classic cobweb. Evoke a gothic feel with another kid-friendly decor option that will feel extra creepy-crawly above a bed or behind a couch. 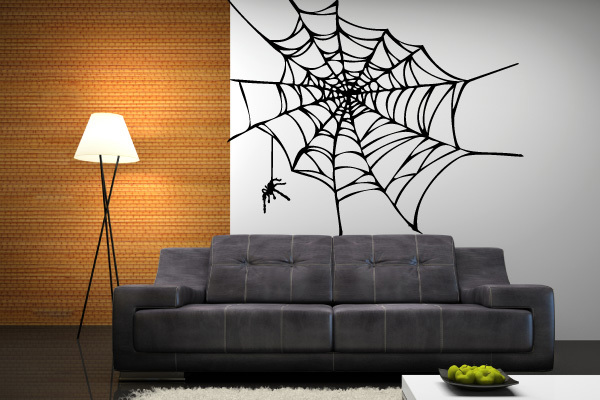 The Spider Web Wall Decals can be applied with or without the spider. If your roommates and company happen to be a little more mature, this horrifying clawed hand will be the perfect addition to your living room. Whether you’re hosting a costume party or an intimate scary movie night, this Shadow Claw Wall Decal will set the mood. But when All Hallows has passed, you need something warm and cozy to transport you to the delights of Autumn. And what’s more Autumn-ful than fallen leaves in burnt orange and wine red? These Happy Thanksgiving Wall Decals will make the perfect backdrop for your family feasts! These Falling Leaves Decals are a versatile option that will last you from the beginning of September until it’s time to put up your Christmas decorations—and even then, you can simply tack on a few glistening ornament or snowflake decals to bring it into the winter. Real ornaments are great, but can you ever really have enough? These Reflective Tinsel Wall Decals will make your home feel as warm and cozy as could be. Imagine curling up with a cup of hot chocolate underneath these glimmering ornaments—ones that the family pet can’t get their paws on. Even if it’s still 60 degrees outside in December, these Let It Snow Decals will you feel like you’ve climbed aboard the polar express. Arrange the snowflakes yourself, and choose any color you want—gray, light blue, and metallic all work perfectly on white walls. Get festive with this lively leaping Rudolph. The whimsical Rudolph Wall Decal can pair with any style of decor and will delight guests of any age. You can choose the classic red Rudolph or pick another color to match your mantel decor. What would Christmas be without a Christmas tree? Sure, you already have one, but probably not in every room! Use this Modern Tree Wall Decal to bring the joyous spirit into every room—even the ones that don’t have space for a full-blown, real-life tree. Could Easter even occur without flowers blooming everywhere? Welcome spring with this Floral Bouquet Wall Decal. It's really very important that if you want kid-friendly wall decor, these Full Moon Bats Wall Decals are sure to bring the spook without overdoing the scare. Thanks for sharing this great article.